I mentioned it a while back, but I was lucky enough to be asked to be a part of the PROBAR Blogger Network. One of the many AMAZING perks of this relationship is being sent product to try out, stock up on, etc. Aren't they lucky to have me?! HA! 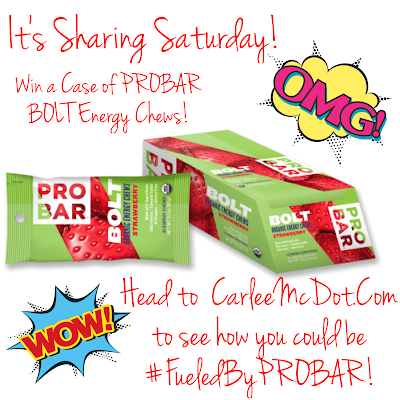 Well, one of my FAVORITE products from PROBAR are their BOLT Energy Chews. Like, legit, they are the way I fuel for EVERY long run. Lucky for you, I have a couple extra boxes in my cupboard and I figured, instead of continuing to stockpile and hoard them, I would offer one of those cases up to a lucky reader. 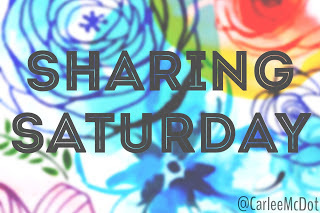 I mean, that is the point of Sharing Saturday, right?! There will be ONE lucky winner this week!! The winner will get a box, which includes 12 packages, of Strawberry (since it is my favorite flavor) PROBAR BOLT Energy Chews. Enter early and often (some of the entries are available DAILY). 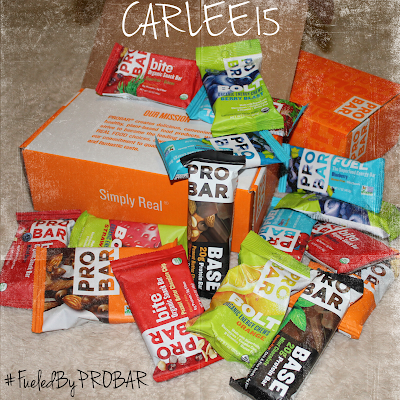 I did want to mention, this giveaway is NOT sponsored or affiliated with PROBAR in any way... I am just sharing some of my extra fuel with YOU! It will run through Friday, August 28th at 11:59pm PST. I will contact the winner via email (using the email address listed through Rafflecopter) who will have 24 hours to respond and claim their prize. Winner must be a U.S. resident. Also, the entries ARE verified, so please make sure you complete the task or I'll have to pick a new random winner. Void where prohibited. And just in case you don't win (or maybe you do win and want to try another product as well), I have a 15% off coupon code EVERYONE can use on their orders (this includes gear, variety packs, etc) - so make sure to stock up! Use code "CARLEE15" to save 15% off your online orders! 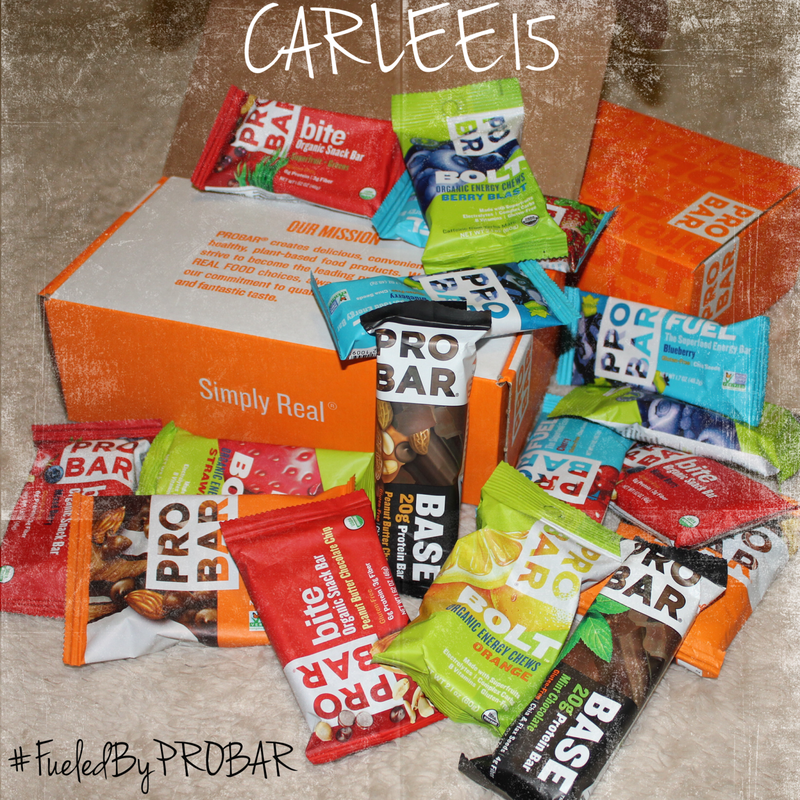 Have you ever been #FueledByPROBAR? I've used Gu and Powerbar chews in the past. Would love to give these ProBar's a try! I've used Gu before, but these look delicious! Strawberry is one of my favorite flavors so I'm dying to try them out! I use Gu fir my long runs. Salted Carmel is my favorite. Green tea, SOS, oatmeal 1 hour before the run. Vega Energizer (sugar free) 30 mins before the run. ...and every hour after that, pocket fuel. I'm down to try these if they make me fast like you. Ezekiel Bread with 1 tbs natural peanut butter and half a banana in the morning before my run. Just getting into longer distances so I haven't actually tried any gels or chews. I'm interested in testing some out though. On my longest run i did bring a small packet of fruit snacks. I've never tried these. I've tried all manner of other things, and some disagree with my tummy (the blackberry Hammer gels) and others don't (any kind of gel or Gu or Clif Shot in vanilla). Been using Honey Stingers as fuel but willing to try something else. Also may need an extra water bottle on my running belt. Ran out on my 13-miler this morning. Whoops! I've been eating Go Macro bars before long runs (I won some in a giveaway), but I'd love to try Pro Bars. I've eaten everything from oatmeal to pop tarts to granola bars but I do some fasted, too. I love energy chews and Jelly Belly Sport Beans. I love ProBar protein bars. I didn't know they made chews. I've been using Gatorade Endurance Chews lately, and they seem to be working well for me. I have been meaning to try the ProBar Chews though! They seem like they would work great! I used to take Gu but I've recently started using Cliff Blocks and I LOVE them! I use Cliff shot bloks with UCAN to start off with. I would love to get away from fueling with carbs but don't have the training cycle time to try it. My go to fuel for long runs is Cliff shots before and Gatorade gels during. Love ClifBlocks (Cran Razz) or Sport Beans, but these look pretty awesome too! I usually eat a bowl of oatmeal before long runs. I've been using a lot of "real" food (granola bars, fruit) to fuel lately. I like Gu but sometimes my tummy doesn't! I use Honey Stingers for my long runs. I normally use my Jelly Belly Running Beans, but I think I need to make a CHANGE. I sure would love to try PROBAR BOLT!! Love the Clif Shot Blocks, Honey Stinger Waffles and Bonk Breakers. Gu's work on my shorter distance but have learned I can't stomach them for my longer runs! I just make sure to eat a meal with protein before hand. I love these chews! 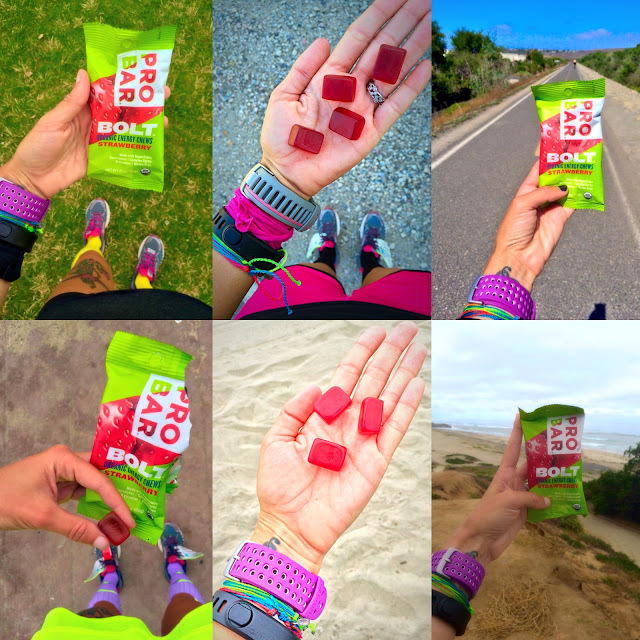 I also use Gu or plain old gummy bears on long runs! I use gu or honey stinger!! My fuel of choice is Peanut Butter GU. I typically use GU or Honey Stinger Chews. I like these and am trying the Skratch ones as well. I currently use Gu - but I've used the Honey Stinger chews before. Would be interested in trying these ones out. Awesome blog!!! You are so kind and shareful! I know that might not be a word, but I think it can work for you!! I usually choose cliff shots. A combo of sorts is what I like to use when running: squeezable applesauce banana blend pouches, honey stinger cherry cola flavored chews (heck it's my opportunity to have "soda" since I don't like soda) and obviously Probar chews. Strawberry is my fave too! I use Honey Stinger and GU Roctane gels. I'd love to try some Probar! currently I love using Gu and honey stinger waffles! I've used honey stinger waffles, probar bite, pretzels, and pbj. My go to is a protein bar. I like granola bars and apples. I like fueling up and hydrating up with a smoothie made with coconut water! I tend to use a GU or Clif chews - both are ok, but I think I prefer the chews a little more. My go-to fuel is GoMacro bars! I've been using Cliff shots. I'd love to give Probar a shot, though! I use Honey Stinger. would love to try Probar!